Is war opposition a crime? When did Opposing War, become a crime in this country? 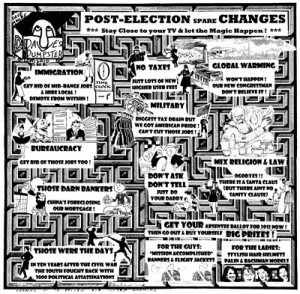 On Sept. 24th 2010 the FBI raided the homes of eight Twin City peace and international solidarity leaders and the office of The Mpls. St.Paul Anti-War Committee. Some of them were involved in organizing the legal protest at the Republican National Convention in 2008. According to the FBI, these individuals were looking for “evidence of material support for terrorism charges.” This is absurd and undemocratic. Three, of the eight peace activists, are being subpoenaed by the Department of “Justice” to appear before the grand jury. I must be loosing it. Damn rabbit ears…maybe this way…no, nothing. What is up with this new thin screen HD television? 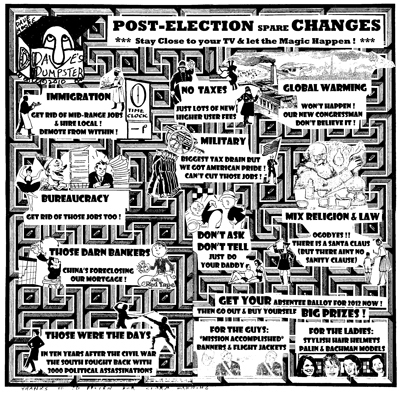 No more political attack ads? Arrghh. Seriously, many of these ads have the effect of splashing acid on the opponent’s face. An ugly caricature is created. T.P.- G.O.P. types appear to be more proficient in the art. The series of ads produced by Mark Dayton’s people were more positive. They included visual-bites of an industrial scenario set at Smith Foundry (located in East Phillips). My co-workers are now dubbed “movie-stars” by the Teamsters Union! 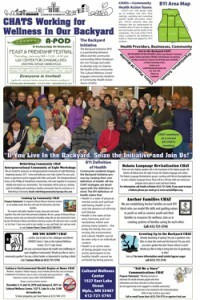 Click for a full size PDF of the Backyard Initiative page with info on all of the participants. At a time when many are still waiting anxiously for health reform information from our government, the need toll continues to rise. The free clinics are bulging at the seams as too, too many are running out of resources, and simply losing hope. Portico Health Net continues to fill the ever expanding void that many families face. They have served the people of the Phillips Community, the most populated neighborhoods in The Twin Cities, in ways that are actually saving lives, minds, bodies and souls. Working with a group of persons that do not hesitate to show their commitment, concern and dedication to those in need of affordable and reliable health care, Portico Health Net continues to help simplify and meet those needs, not just for Phillips Neighborhood residents, but to the entire state of Minnesota. By working not just with Abbott-Northwestern hospital, located here in Phillips, but 12 other hospitals located in Minnesota, Portico is making a difference with their Safety Net Coverage and Preventative Care Needs programs most particularly. Wendell Phillips’ 199th Birthday is November 29, 2010. 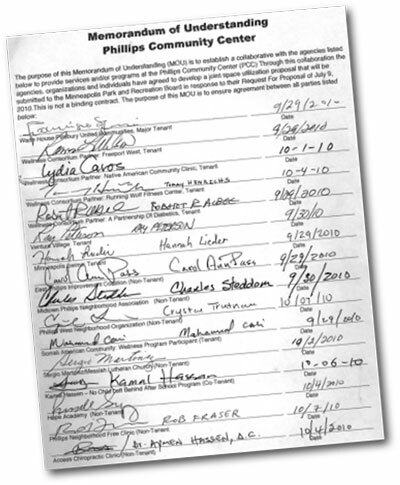 Phillips Community proudly uses his name and legacy advocating for peace and justice for all. 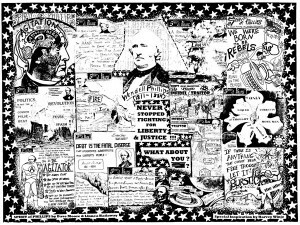 The Alley Newspaper celebrates Wendell’s 199th Birthday with the exclusive, Special Edition, Spirit of Phillips cartoon collage below by Dave Moore and Linnea Hadaway and with birthday cake on Dec. 3rd at the Alley’s Annual Gathering (see page 5). The Alley Newspaper will celebrate Wendell’s 200th Birthday with a special event in 2011. Please join us in honoring Kathee Foran for her many years of service to In the Heart of the Beast Puppet and Mask Theatre and the Lake Street Business community. A thank you party will take place at In The Heart of the Beast Theatre on November 10th from 5:30 to 7:30pm. All are invited! Kathee Foran began work with In The Heart of the Beast as an organizer of educational touring shows and residency programs. In 1996 she became the Executive Director, joining the Artistic Director and a vibrant team of staff artists and administrators to carry out the daily work of the theatre and to assure its ongoing financial viability. Kathee’s tenure featured several improvements for the theatre’s home base on East Lake Street including finalizing the purchase of Avalon Theater, and working with the Neighborhood Development Corporation and the Latino Economic Development Corporation to renovate and open Plaza Verde as a multi-use facility for community use including a 3rd floor social hall. (HOBT now rents space in Plaza Verde for educational workshops, for the building of puppets, and for the storage of its puppet collection of 36 years). It’s finally done! Last week we sent to the Minneapolis Park and Recreation Board a signed Memorandum of Understanding (MOU) for most of the organizations who want to work together with the Park Board in the reopening and ongoing operations of the Phillips Community Center. It’s located at 11th Avenue and 24th Street in Ventura Village of the Phillips Community. In addition to prospective tenants, others who wish to have an ongoing presence in the building also have signed the agreement. Those seeking to be tenants and are signatories to this MOU are the Waite House/Pillsbury United Communities, Freeport West, Native American Community Clinic, Running Wolf Fitness Center, A Partnership Of Diabetics (A-POD), Ventura Village (Neighborhood), Guri Nabad, a No Child Left Behind After-School Program and Minneapolis Swims. 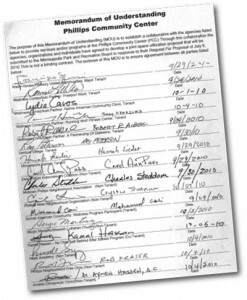 Representatives from the other three Phillips Communities are also signatories to the MOU and include East Phillips Improvement Coalition, Midtown Phillips Neighborhood Association and Phillips West Neighborhood Organization. Also participating as “non-tenants”, but strongly interested parties include Sergio Martinez from Messiah Lutheran Church, Hope Academy, Phillips Neighborhood Free Clinic and Access Chiropractic Clinic. Lifeway mural “Our Power comes from Our People”, on the south wall of Nawayee Center School (2421 Bloomington Avenue), was dedicated October 22, 2010. Twenty-two students muralists with elder artists Francis Yellow and Marilyn Lindstrom worked together four seasons (fall 08, fall 09, spring 09 and fall 10) to design and paint the 18’ X 18’ mural. 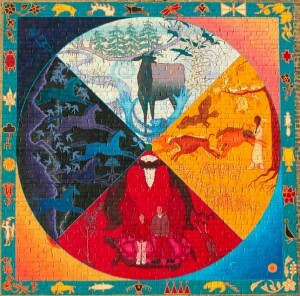 The young people made the mural through Lakota Lifeway: starting by creating a collective dream for the mural- to the final gifting of the mural to their community. The Backyard Initiative (BYI) is a partnership between Allina and the community surrounding Allina headquarters (on Chicago and Lake) to develop ways to improve the health of the community. The Cultural Wellness Center engages community residents in Community Health action Teams (CHATs) to generate ideas and strategies that are implemented by residents that will have an impact on personal health and the health of the community.